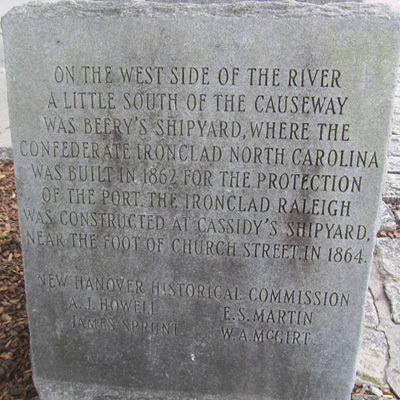 Source: Beery's and Cassidy's [Cassidey's] Shipyards Marker, Wilmington. Photograph courtesy of Natasha Smith. The marker is a simple stone slab, approximately three feet tall, featuring an angled face and inscribed on the front. It commemorates the contribution of two local shipyards, Beery's and Cassidey's, to the manufacture of Confederate naval vessels during the Civil War. The marker backs up to a companion marker memorializing William Tryon and William Houston. New Hanover Historical Commission. Members of the commission sponsoring the monument, A.J. Howell, E.S. Martin, James Sprunt, and W.A. McGirt, were prominent Wilmington politicians and businessmen in the late 19th and early 20th centuries. During the Civil War Wilmington was home to two shipyards important for the manufacture of Confederate naval vessels, Beery's and Cassidey's. The Confederate ironclad warship the CSS Raleigh, referenced in the monument's inscription, was manufactured at Cassidey's. The ironclad steamer CSS North Carolina, also honored in the inscription, was built at Beery's. Following the war, Beery's, the larger of the shipyards, bought Cassidey's. 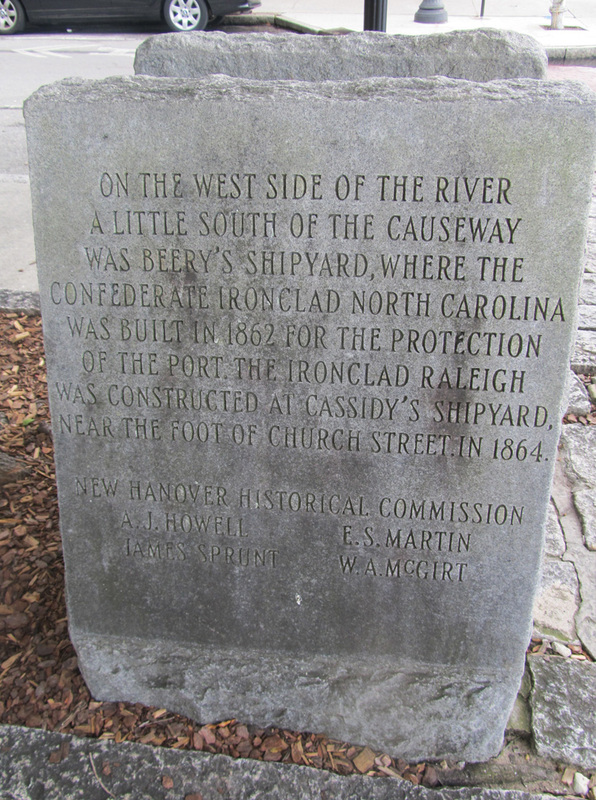 Beery's Confederate Navy Yard was located on Eagle's Island, across the river from Wilmington, and Cassidey's was located at the Wilmington waterfront at the end of Church Street. The monument sits at the end of Market Street where it meets North Water Street, just across from the waterfront boardwalk. The monument is located in the cobblestone median dividing Market Street, shaded by a small tree.